Last day of the Edinburgh International Film Festival today — big party in a cave! A closing film, NOT ANOTHER HAPPY ENDING, written and produced by people I know! And from tomorrow, though I have stored up a few mini-reviews of films seen, Shadowplay will go back to being more random and eclectic. Still thinking fondly of FANTASTIC VOYAGE, shown in the Richard Fleischer retrospective. The opening intertitle we saw was actually different from the one sampled above — it was more colourful, being set against a deep blue background, which suits the film’s pop-art / plastic / electron microscopy / psychedelic sixties sci-fi feel. It also made more vague, giddy and delightful promises that this kind of thing would be happening for real in the near future. Of course, Tory cutbacks mean you cannot yet have Raquel Welch injected into your bloodstream on the National Health, despite the obvious benefits. You’ll be lucky to get Arthur Kennedy. In fact, one could probably make a case for David Cameron being a kind of miniaturized Donald Pleasence in the bloodstream of the body politic, covertly loosening our lasers and fraying our tow lines. Inside the brain — neurons sparkle with visible thoughts — a scene which contains more thoughts than Sylvester Stallone’s entire career. Fleischer kept making these informal trilogies — true life psychopathy (COMPULSION, THE BOSTON STRANGLER, TEN RILLINGTON PLACE), classic SF (20,000 LEAGUES UNDER THE SEA, FANTASTIC VOYAGE, SOYLENT GREEN). This one is pretty silly, but it kind of knows it. Early dialogue sets the tone — “I don’t want to be miniaturized!” protests Stephen Boyd, weakly. “It’s just for an hour,” says Edmond O’Brien. You can’t argue with that. The script seems determined to keep Pleasence in the shadows as the last man you’d suspect, only gradually revealing his perfidy (He believes in evolution, is therefore a commie) but by casting D.P., Fleischer throws him to the audience with neon horns blinking on his bald pate. This generates a clear line of suspense, but does leave the heroes looking stupid. Still, I can’t help wondering why there was no sequel (asides from the wonderful INNERSPACE). The movie seems to be preparing one as you watch, as Edmond O’Brien puffs cigar after cigar and empties the sugar bowl into his infinite series of coffees. At the end of this one, he should have suffered a massive heart attack, necessitating another mini-submarine intervention. Sequels are always cheaper, so this time the team would probably consist of Don Murray, Roddy McDowell, Pamela Tiffin and Michael Dunn, who’s miniature already and will save on costuming. In the third film, O’Brien is miniaturized and injected into himself, creating an eternal fractal loop, spinning from THE HUNCHBACK OF NOTRE DAME TO 99 AND 44/100% DEAD and regressing to the vanishing point like a human Matryoshka doll. 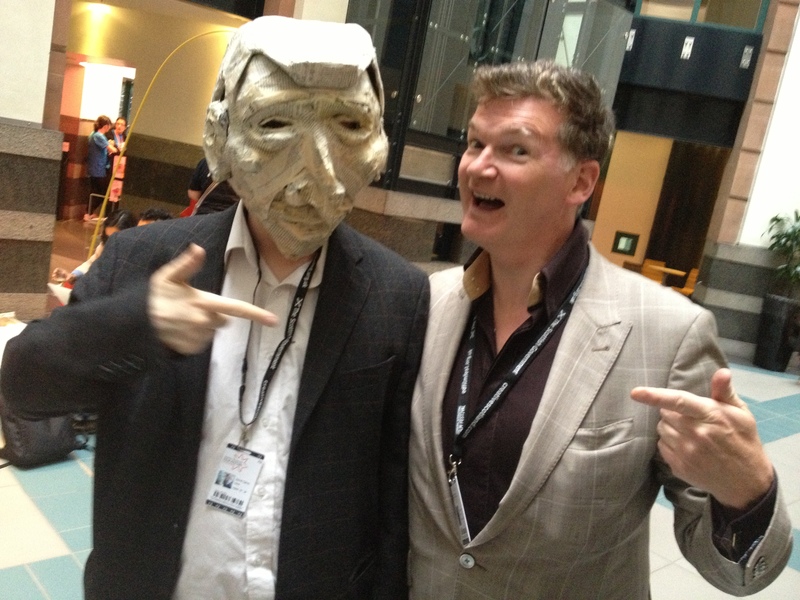 Me as the False Natan and Paul Duane as himself, at the Edinburgh International Film festival. Weirdly, my mother considered calling me Nathan. I used to not like the name, but it would have been more distinctive. NATAN shows again today, with a 9am Industry Screening and a public show at 8.30 pm. The above image isn’t really the correct way to sell it. It’s quite serious. Yesterday I enjoyed Shivendra Singh Dungarpur’s CELLULOID MAN, a long but lovely look at P.K. Nair, India’s answer to Henri Langlois, master archivist without whom all pre-1950 Indian cinema might well have been lost. It’s the third film, along with NATAN and Mark Cousins’ superb A STORY OF CHILDREN AND FILM, in the film-on-film sub-section of the Fest. Now I just need to start on my next production so I can have another film to screen next year! Being a filmmaker is addictive. There’s an image in NATAN of a man strangling in masses of celluloid — I felt as we shot it that I had finally achieved the definitive image of my life story. NATAN gets an approving mention in The Scotsman. At this point in the Film Festival, nearer the end than the beginning, I always feel I’ve seen hardly anything, I always seem to have missed the films everyone’s talking about, though this year I did at least catch I AM BREATHING, led to it partly by the fact that it’s made by friends. It’s also brilliant. It may get a national release. Yesterday I saw another friend’s film, DUMMY JIM by Matt Hulse, based on the published journal of James Duthie, a deaf Scotsman who in 1951 cycled to the Arctic Circle (he set off for Morocco but it was getting too hot as he neared Spain so he changed his mind). Duthie’s homespun, naive reactions to the people and places he encounters form just one layer of a playful, experimental film which creates a kind of magical simultaneity — as Duthie rides North, the actor playing the role records his VO in a Ramones T-shirt, a tombstone is carved for the real man, a commemorative certificate is hand-drawn (mega-closeups of cross-hatching form a 3D landscape, ink-lines bulging wetly from paper), pastries are prepared, and a school play is rehearsed in Duthie’s hometown (or near it). All this interwoven with Duthie’s 16mm home movies of his 3000-mile trip. 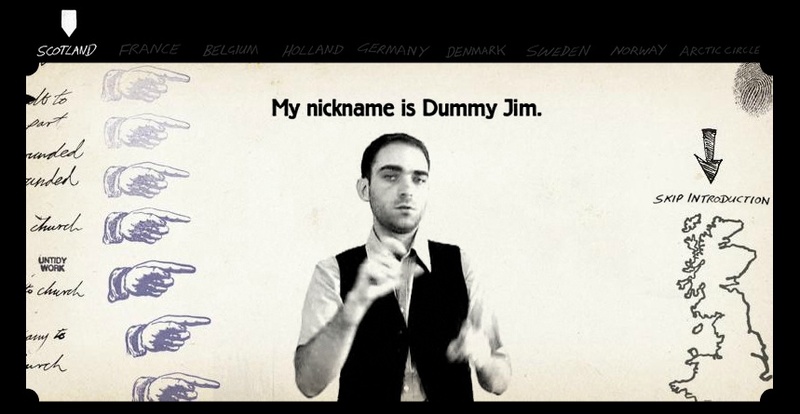 DUMMY JIM (OFFICIAL TRAILER) Directed by Matt Hulse from Matt Hulse on Vimeo. Several years and at least one gear in the making, DUMMY JIM is a triumph of originality and probably the most charming Scottish film since Bill Forsyth’s heyday. As a deaf Scottish cyclist, my Dad really needs to see this film, but he’s broken his arm coming off his bike and can’t go. But you’ll be there, yes? 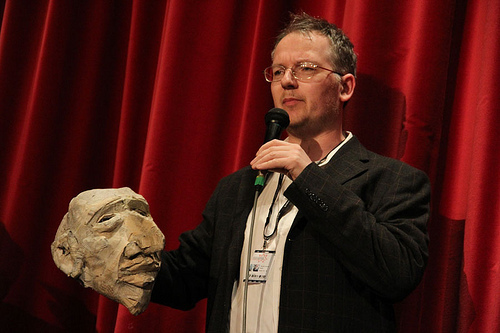 Me at the Q&A after the first screening of NATAN, holding the Natan mask. Tomorrow — NATAN screens again. Industry screening in morning, public in the evening (8:30). Please come to the public if you have the choice — tickets still available. We have reports of tears being shed by strong men and women, but nobody is depressed — righteously angry, maybe, but also inspired. Plus, despite a scarcity of press coverage at this year’s festival, we have two good reviews: 1 and 2. 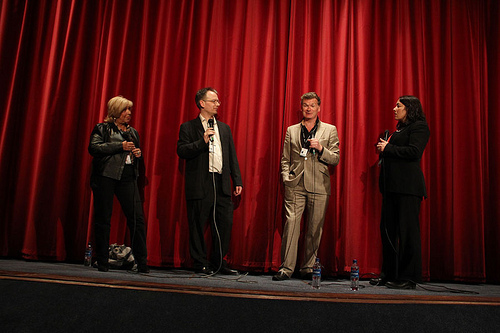 Lenick Philippot, Bernard Natan’s grand-daughter; yours truly; co-director Paul Duane; Diane Henderson of EIFF.